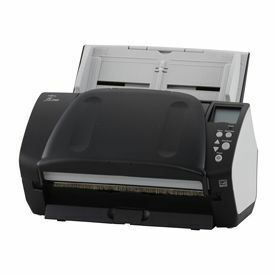 With duplex scanning speeds of 120 images per minute at 300 dpi in Colour, Grayscale, and Monochrome, the fi-7160 incorporates acoustic sensors, which ensures your data is captured with smart ultrasonic technology, and reduces rescans by cleaning up documents automatically in a single pass. Reliability is enhanced even further with new skew prevention technology for exceptional paper handling. Built on class leading and proven feeding capabilities the fi-7160 scanner now come with a unique paper protection function that is based on acoustic sensors; iSOP (Intelligent Sonic Paper Protection), which reduces the risk of having documents damaged by sensing the audible noise of paper movements and stopping the feeding of sheets when an irregular noise is encountered. Should you be scanning mixed batches of differing thickness of documents then the “skew reducer” reduces the physical skew that documents encounter through the paper path ensuring that each document is captured with the utmost precision and simplicity. The fi-7160 comes with Paperstream IP and PaperStream Capture software.